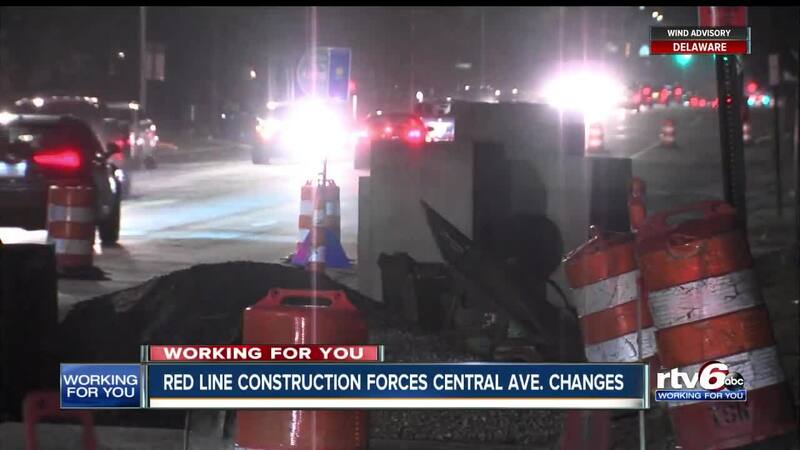 IndyGo Red Line construction forces Central Avenue changes. INDIANAPOLIS — Signs at 58th Street and Central Avenue alert drivers that crossing traffic does not stop. People who live in the area are worried somebody's going to get hurt. Susan Duffy and Linda Stevens live along Central Avenue, where drivers are trying to make sense of the new traffic pattern. "I think people are really startled and I think people are really not prepared for this," Duffy said. The Department of Public Works has converting intersections at 40 Street and 58 Street. "It used to be a four way stop. Now it's just a two way stop," Duffy said. DPW is also activating newly installed traffic signals from 42 Street to 57 Street. Due to the acceleration of IndyGo Red Line construction on College Avenue, DPW told RTV6 they acted as fast as possible to notify neighbors. "All we want is details. We don't want transit to go away," Duffy said. "We just want to know what's going to happen to our neighborhood." On Wednesday, State Senator and Mayoral candidate, Jim Merritt, set to speak about the negative impact the changes are having on residents. Stevens says she wants to see city leaders take action. "I'm pleased to see that it's an issue," Stevens said. "And an important issue enough that he's having a press conference. I hope our voices will be heard." If you would like to know more about the IndyGo Red Line construction timeline, there are two public meetings scheduled for Feb. 19 at the Indianapolis Art Center — one from 11 a.m. to 1 p.m. and the second from 4 p.m. to 6 p.m.